I use CHAR (characteristic) saves a lot in my games; I like to get as much mileage out of the characters' stats as possible. For success, I require that the player roll below their relevant stat score — for example, if you have an INT of 15, for a successful (unmodified) INT save you'd have to roll 14 or less. Where success in a situation is a matter of luck, or the grace (or anger) of the gods, I use the standard level-based character save mechanism with a d20, but where it's a matter of the character's own physical or mental abilities, a CHAR save is more appropriate. I've vacillated between using 3d6 and 1d20, but I've decided to stick permanently with 3d6 from now on. The graph shown here (which, as usual, you can clickupon to bloatify) describes the result curves for each. The d20 curve is perfectly straight. You're as likely to roll a 1 or 20 as you are to roll any other number. It's simple, but that's about all it has going for it, and it doesn't reflect the distribution of stat scores as rolled. Compared with the 3d6 curve, it markedly benefits those with very low stats, and markedly penalizes those with very high stats. With 3d6, on the other hand, your chance of success in a simple, unmodified CHAR save better reflects the rarity of exceptional (or pathetic) stat scores, and positive or negative modifiers can become significant much faster than in the linear d20 scale — for example, if you have an INT of 9 and you make a CHAR save at +2, on d20 that gives you +10% chance of success, while on 3d6 it means +25%. If you're making the save at -2 on the other hand, while on the d20 scale it's just -10%, on the 3d6 curve it's actually -16.6%, and those penalties or benefits flatten out a lot at either end of the curve. What I haven't quite figured out just yet is how to accommodate CHAR scores beyond the 3-18 range, especially in CHAR-vs-CHAR contests. I have an idea or two, but I think I need to do some more maths to see whether they'll work as I hope they will. Anyway, BELL CURVES RULE! LINEAR SCALES DROOL! YEAH! As mentioned in the comments, those with stats over 18 could be assumed to automatically pass any unmodified CHAR save, and very difficult unopposed tests could just require more dice — 4, 5, 6 or more d6, with the players (or monsters) still required to roll below their relevant stat. All that would be required on my part would be to formulate a rational scale of difficulty, probably a FUDGE-like descriptive scale would be most useful, methinks. As far as opposed CHAR-vs-CHAR rolls go, I'm tending towards a dice-pool system in which you get 1d6 for every 3 points in the relevant stat, and then do a roll-off. The opponent who rolls the highest score wins the contest. I was leafing through my copy of the Swords & Wizardry Monster Book this evening, and scribbled pictures of a couple of the critters therein: the Carrion Fly and the Clawed Fiend. Et voila! I don't know how closely my imagination matches those of the people who originally came up with the monsters in question, but there you are anyway. 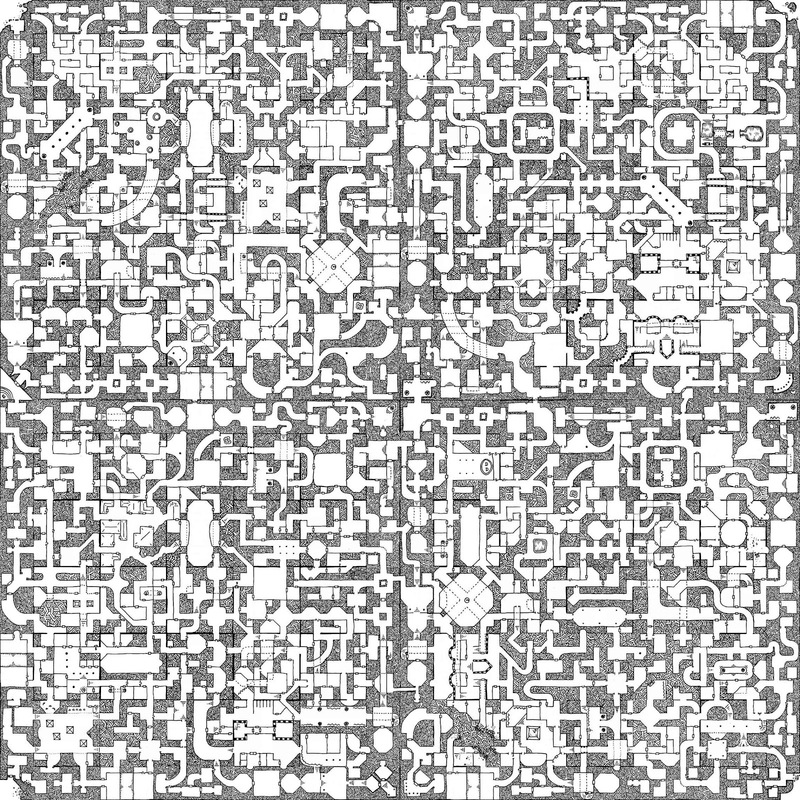 I'm running a megadungeon at the moment. The party are in Hell, though they haven't yet experienced much hellishness. Yet. Muahahahahahaaaaa.... and all that. 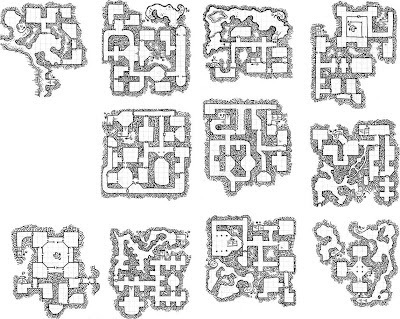 Anyway, I have to say that I'm not a great fan, as a DM, of the traditional sprawling twisty-turny megadungeon level map. The reason for my lukewarm acceptance of this model of mapping is purely to do with manageability. A map like this is going to require pages and pages of room and encounter descriptions, even if they're pared down to the bone. That means a lot of page-turning, and inevitably there will be times when numbered encounters, which may be adjacent on the map, will be pages apart in the written descriptions. That adds a level of confusion I don't need. Additionally, the sprawling nature of the map means that the party could go just about anywhere, any time, which makes it that much harder for me to plan ahead, or to take into account relationships between dungeon denizens on the fly, or to foreshadow upcoming event possibilities. I don't mind having to do a little prep work as DM, but I prefer to keep it as minimal as possible. These little maps by Dyson, on the other hand, are relatively limited in terms of their geography. I can fit a whole map on a single A4 page at a scale large enough to read easily and to make legible notes on, and I can fit the written descriptions for the whole map on a single facing page. The modules can be easily interlinked just by noting where the exits are, and how each exit connects with any of the other maps. 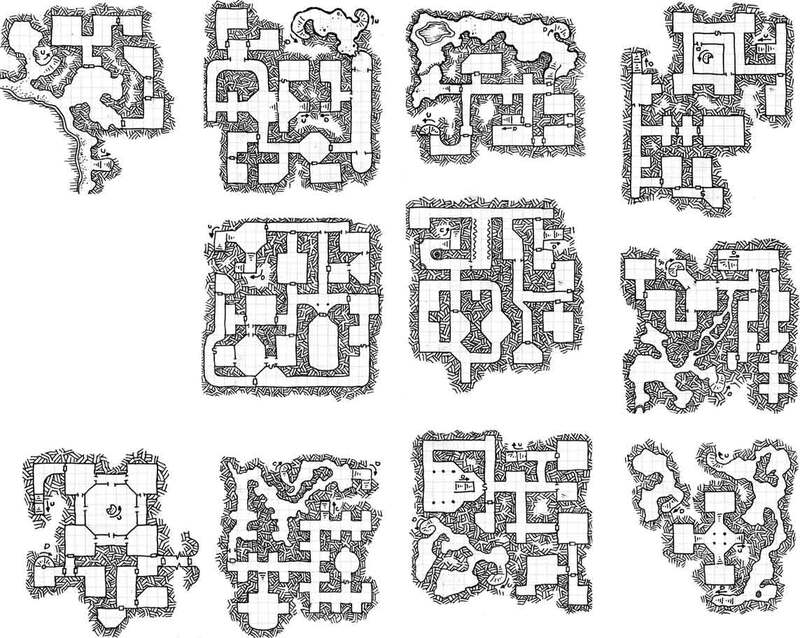 They could all be part of the same level, or they could be scattered across dungeon levels. Best of all, wherever the party goes, the map and description are right there together — which makes for excellent manageability. The end result is transparent to the players; as far as they're concerned, all of the maps might as well be one huge many-folded confusing mega-map. 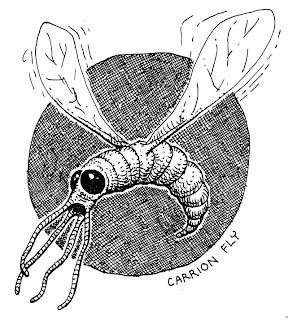 And if I decide, on the spur of the moment, to introduce an area in which all the tunnels are made of rotting meat, swarming with black beetles, worms and maggots, it's a piece of cake to introduce a new map into the ecosystem. 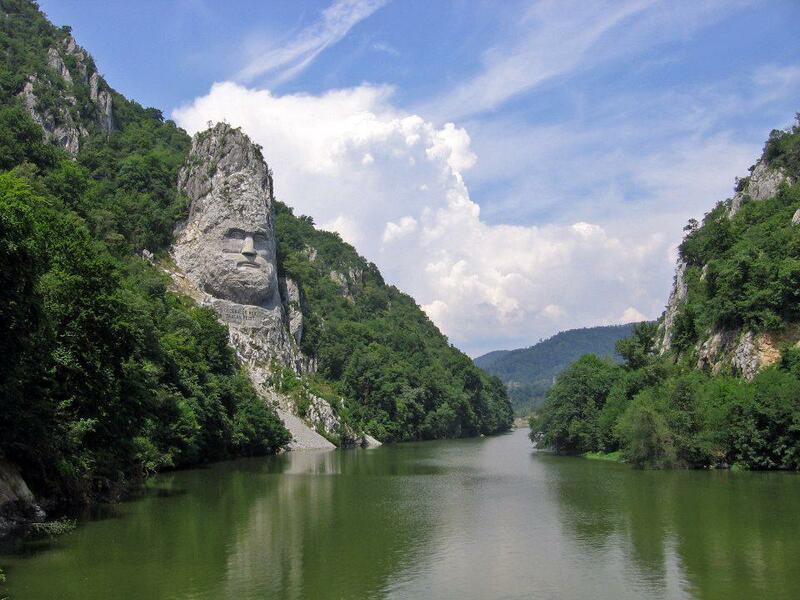 Monumental carving in Romania honoring Decebalus, a general who handed the Romans their collective arse. Three modifiers to a roll are too many for regular off-the-cuff calculation, in my opinion. But in this case they'd generally only have to be worked out once and noted on one's character sheet. If you wanted to go that way, you could also build in modifiers for long/short/heavy/light weaponry as well, though that might start getting a bit convoluted. I've used at least one oodle, and probably many oodles of character generation methods across a multitude of roleplaying systems. I've even built a character for a game called Space Opera (I think) which had a character generation system so convoluted that by the time we'd finally finished, we were too exhausted to actually play the game. 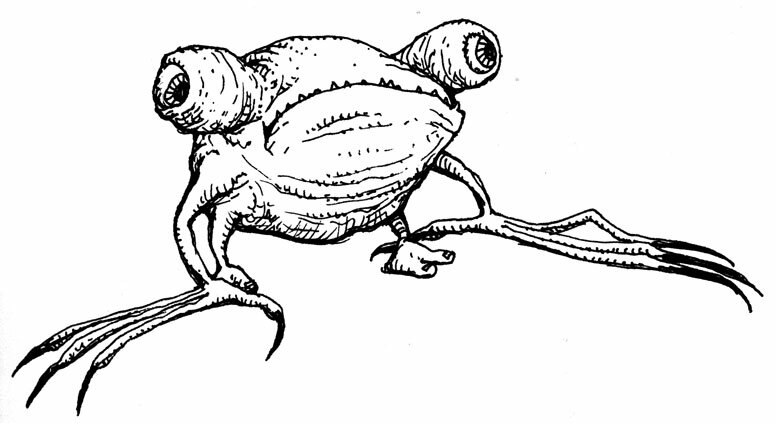 What I want to concentrate on right now are some of the methods I've used to create characters for my various D&D campaigns, in no particular order. This is the system I was first introduced to when I started playing AD&D in 1981. As far as I could see, from the fairly tiny pool of D&D players in Palmerston North and Wellington in those days, it was pretty much the default method for everyone. It's a pretty decent method that is reasonably good at not producing a string of crippled gimps, but exceptional characteristics (i.e. anything in the 16–18 range) were still rare enough to be special. We seldom discarded a stat-block as rolled, unless it was really, really bad. 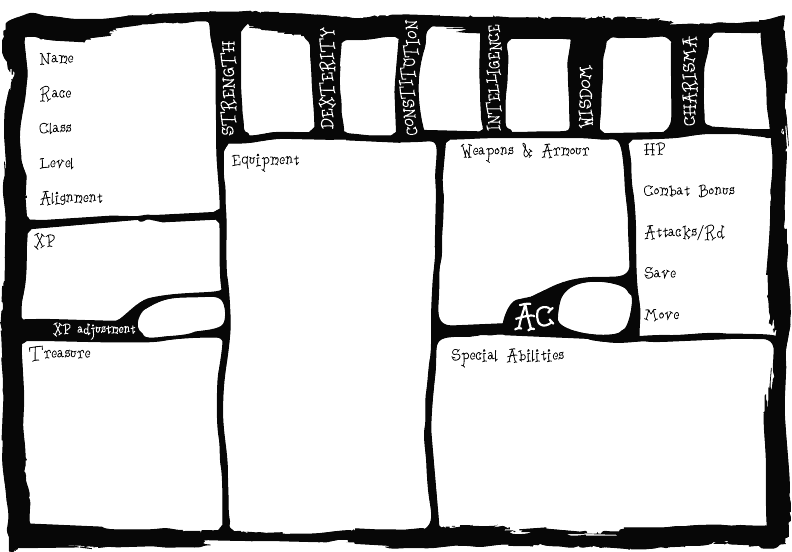 To begin with, we just rolled the stats in order and built whatever character class would fit them. In a revolution in player-enablement, our DM actually started allowing us to swap two of the stats around so that we weren't necessarily forced into (or out of) any given class. Wow! The power! It was under this system that was born a character whose every stat was either 10 or 11. Naturally, he had to be called Mean Norm the Average Ranger. (That's a statistics joke, folks. They're few and far between, so make the most of it). This is a system I came up with all by myself, though the chance of me being the first person ever to have this particular blinding flash of inspiration is pretty small. 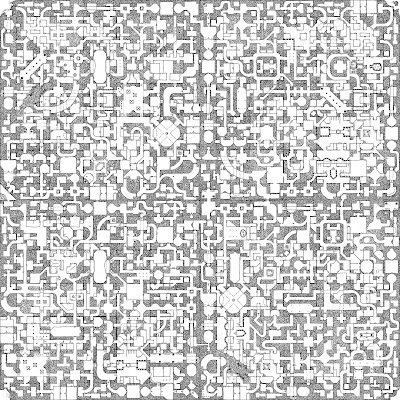 In this system, the player rolls 3d6 36 times, writing the results in a 6x6 grid like the one shown here. The order in which the stats are laid out is unimportant as long as they're the same horizontally and vertically. The player can choose one statblock from any of the rows or columns, or, at a pinch, from either diagonal. The stats can't be rearranged, so if you want to play a specific class you may have to make some compromises — for example, in the set shown here, if the player wants to play a magic-user and get the 16 result into their INT slot, they're going to have to accept a CHA of 6. This is a fairly decent system for pumping out characters that will perform pretty well. It gives the players a certain amount of freedom to choose which class they want to play, but being limited to 3d6, doesn't often produce terrifying Übermenschen. 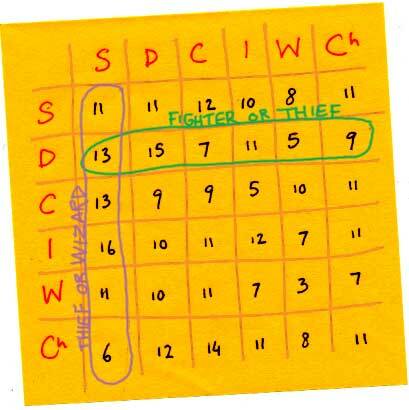 The stats wrap around, so if you fall off the right-hand side you complete your set of six from the left — as shown in the animation, the red set (fighter or thief) starts its statblock 5 places from the right, so its 6th stat is taken from the left-most. The statblock, once chosen, can't be rearranged. Again, it's a system designed to allow for a degree of player freedom without tending towards mega-stat monsters. I include this although I've hardly ever actually used it. I would only use it these days in a high-mortality one-off game in which character replacement is going to be very frequent. 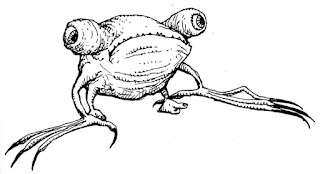 I know it has a certain masochistic appeal to some grognards, but in my experience most people prefer to play reasonably capable characters; the novelty of having to deal with a weak, clumsy, sickly, stupid, foolish, hideous character wears off pretty quickly for most. I was looking at one of my recent character sheet designs today, and it struck me that, though efficient, it was rather sterile. So I whipped up this little one, which will fit on an A5 card. Alternately, you could print it at the head of an A4 (or letter) sheet and have a whole lot of extra space to make other notes on. This one is not sterile. This one is... woogly. You can grab the PDF here — it's only about 37 K.